How to move files from the Storage Area to the Word Area? Remember, for new Bundledocs Users, when moving documents from the Storage Area to the Work Area, make sure the dash line appears before dropping the document(s) into the area. The dash line appears as a guide to ensure you are dropping your documents in the correct area. Can I move multiple files at once in Bundledocs? Yes. Within our Drag & Drop series, we have covered a number of ways to move documents within Bundledocs. These include: moving a single document, moving multiple documents from different areas and moving multiple documents in sequence. In addition to these Drag & Drop functions, Bundledocs Bulk Actions feature can also be used to easily move documents from one area or section to another. This process is simple and is particularly beneficial when moving documents within a large brief. For those not comfortable with dragging and dropping documents, our Bulk Actions feature provides an easy alternative for moving multiple files within your case. 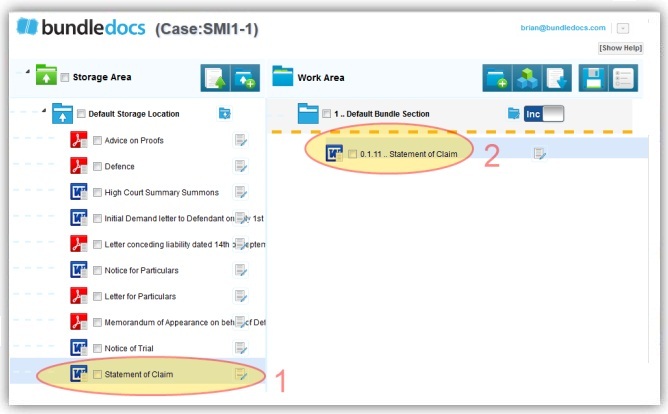 Beside each section and document in your bundle is a tick box. Press the box to select. Once a box is selected a tick should appear within the box. Alternatively, select the box again to exclude. Repeat step one. By selecting multiple documents, these documents or sections will be included in your ‘bulk actions’ move. Select the Bulk Actions button (highlighted below in yellow). A window should appear. From the dropdown, choose where you want to move the selected documents. Now let's see how this looks in Bundledocs.. In the third part of our Drag & Drop series, we will address how to move multiple files from one area to another. In comparison to our previous article “How to drag and drop multiple files at once”, this step moves a number of sequential/grouped documents at once. This is great for any Bundledocs user that needs to move a number of documents from the Storage to the Work Area. How do I move a number of grouped files from one location to another at once? Let’s take a look at these simple steps, which we hope will save you time and effort. Press and hold the Shift Key (on the keyboard). While holding the Shift Key, select the last file in the sequence. All the documents between and including the first and last document should now be selected. Release the Shift Key. Select and hold the highlighted files with the mouse pointer and move the mouse to the area where you want to move the files. Top Tip! Remember when moving documents from the Storage Area to the Work Area within Bundledocs, make sure the dash line appears before dropping the document. The dash line appears as a guide to ensure you are dropping your document in the correct position. Following the first part of our Drag & Drop series “How to drag & drop a single file”, this article will address how to move multiple files from one area to another. For Bundledocs users, moving files from one location to another is an important step when creating their electronic bundles. Adopting these drag and drop functions will help save you both time and effort. How do I move multiple items from one location to another, at once? Press and hold the Control Key (on the keyboard). While holding the Ctrl Key, select another file. Repeat step 2 until all the required files are selected. Note: It is important to keep the Ctrl Key pressed to ensure all files are highlighted. When all items are selected release the Control Key. Select and hold the highlighted items with the mouse pointer and move the pointer over to the area where you want to move the file. Moving files from one area to another is a big part of Bundledocs. However, many are unaware that there are multiple ways to move files and documents. In our upcoming Drag & Drop series, we will discuss these different methods further. How to drag and drop a single file? Moving a single document from one area to another involves 3 simple steps. Top Tip! Remember when moving documents from the Storage Area to the Work Area, make sure the dash line appears before dropping the document. The dash line appears as a guide to ensure you are dropping your document in the correct position. Can I Collaborate with Colleagues in Remote Locations on Bundles using Bundledocs? How to Create a Closing Binder in PDF?